Marcia Clark is well known as the prosecutor of O. J. Simpson and for her bestselling series featuring Rachel Knight, a Los Angeles prosecutor. 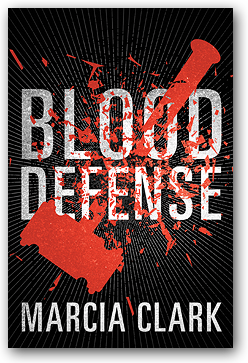 Her latest, Blood Defense, is the first in a new series with criminal defense attorney Samantha Brinkman. She is struggling to make a name for herself until she lands a “dream” case. It is a high profile double-murder case in which one of the victims is a beloved TV star, and the defendant is a decorated veteran LAPD detective. With the aid of her office manager, Michelle, and investigator Alex, Brinkman must use everything she has to spin the publicity. Already facing an uphill battle, she pulls out all the stops in her quest to uncover evidence that will clear the detective and his name. Elise Cooper: Before we discuss your book I have to ask what you thought of FX’s television series, American Crime Story: The People v. O.J. Simpson, since you were the prosecutor? Marcia Clark: It was gratifying to see that they got big issues correct, especially the issue of race and the way that it had an impact on everything in the trial. On top of that it incorporated a lot of major league issues: race, sexism, domestic violence, and the impact a celebrity has on the judicial system. EC: Did you like how you were portrayed? MC: The acting was phenomenal. I am a fan girl of Sarah Paulson and thought she did an amazing job. Sarah gave such a beautiful, nuanced performance. She very accurately portrayed how I felt on the inside with all the pain and frustration as I watched everyone forget this was a murder case. It was agony every single day since the issue should have been how lives were brutally taken with this double homicide. EC: Do you think because Simpson had celebrity status the outcome today would still be the same? MC: He was revered and worshipped by men. The irony to me is that many cops felt that way also. Today, racism, domestic violence, and sexism are still issues. They are still very much on the table. Would he get convicted today if tried? A lot would depend on the judge and the nature of the jury. There was a very bad ruling that allowed racial epithets to be introduced as evidence when there was no basis for it. Mark Fuhrman did not have any opportunity to plant the glove so it should not have mattered if he was a racist or not. If he could not have done it there is no relevance to bringing it in. However, it was going to be injected into the trial one way or another. No matter what we did it was already there months before we started to pick a jury. EC: Did race or celebrity play a role in finding Simpson innocent? MC: Race really skewed it. But the ultimate factors were a combination of race and celebrity. If he had not been famous and was just a regular guy who happened to be black he would have been convicted. If he had been a white guy who was famous he would have been convicted. This combination presented an unassailable obstacle that became clearer every day of the trial. We watched the jury fail to respond to anything we said, which was why the verdict was no surprise for us. The jury basically rejected us from day one. It was horrible. EC: Why did you decide to write this new series? MC: I wanted to incorporate my experiences as a defense lawyer. I started out in private practice as a criminal defense attorney. Currently, I am handling court appointed appeals for the defense. I wanted to write about the interesting moral and ethical wrinkles to riding the defense side because a defense attorney’s goal is solely to defend the client. The prosecutor has to make sure that it’s a fair trial; the defense has no obligation. EC: You emphasize in the book how one of the victims can be forgotten in a multiple murder case. Ron Goldman comes to mind. Please explain. MC: There was Chloe Monahan, a near-superstar actress who resurrected her career, and her roommate, Paige Avner. Chloe was the one people were invested in. Then you have her roommate, Paige, just a normal person who was not famous. I did want to emphasize that the less famous become an after thought. Fred Goldman kept mentioning ‘what about Ron, it is not all about Nicole.’ I am sure this had something to do with me wanting to write the disparity and treatment between Chloe and Paige. Yet, at the time I was writing this I was not thinking about Ron. My life experiences and case works creep into my books whether I am aware of the connection or not. EC: How do your exp eriences influence your writings? MC: My various experiences find their ways to be woven into the stories; even when I did not mean to and they just happen. My experience with a high profile case helped me write this story. Defendants, witnesses, and people I have known throughout my life find their way into my books. Although I do have to say cases have to be made more interesting in novels than in real life. EC: People will remember how your words, appearance and hair came into play when you were a prosecutor. You also speak about these with Samantha’s appearance. Please explain. MC: I wanted to show how a defense attorney with an unpopular client must appear engaging and warm. She has to be as charismatic as possible to try and spin public opinion. How she looks and how she acts reflects directly on her client. In this story the prosecutors had the sympathy of the public so they did not have to have as many sound bites. MC: Juries expect lawyers to look normal. If you walk in looking glamorous you might lose credibility. Yet, you must be very pulled together. It does matter for men and women although women undergo much greater scrutiny. I always wondered, if your career is not modeling why should your appearance be critiqued. I think women who have jobs that have nothing to do with their appearance are held to a standard that is absurd. As long as a woman is pulled together and professional looking I don’t know why there should be any comments. Unfortunately, it is not that way. EC: Can you compare Samantha Brinkman to your past main character prosecutor Rachel Knight? MC: Samantha is more complicated, twisted, less bound by ethics/rules, and someone I could push the boundaries with. She popped into my head while I was thinking of the plot for a stand-alone. Sam does have a dark side with emotional scars from her childhood. She is impulsive, reckless, and loves to push the envelope. On the other hand, Rachel is bound by ethics and has a strong moral compass. She always sees right and wrong with a need to get the bad guy. Both women are strong, intelligent, and sarcastic. I hope readers will root for Sam because they will get to know her on a personal level. EC: Would you ever have Rachel go up against Sam in a case? MC: I might, a definite possibility. Pitting her against Samantha would be so hilarious. It might make me a little schizophrenic, but would be fun. EC: In the book you show how social media becomes a factor in trials. Please explain. MC: If Sam were a wealthy lawyer she would have hired someone to just monitor social media. It is keeping your finger on the pulse to see how the public is feeling about witnesses, the evidence, and your defendant. I definitely wanted to show how today’s technology is being used by lawyers. Although as a writer I find it makes it harder to write mysteries. I put technology into this story by having Sam making announcements on Twitter and her investigators attempting to find people through Social Media. EC: You also write a lot about the realities of a defense attorney. Why? MC: I wanted to show how she is aware that most of her clients are guilty and at times needs to protect herself from them. Some are very dangerous and carry a big threat. In the book I write how people think the defendant most likely hates the prosecutor and judge. The truth of the matter is they most likely hate their own lawyer who heaps the blame. I hoped I showed the mentality of a defense attorney. MC: I’ve already written the second book in the series, Moral Defense. Things are set up in Blood Defense and certain events take place that are pulled through to the next book. There will be a new crime, for sure, but the issues that are hatched in Blood Defense are definitely going to come back to haunt Sam. It’s going to get really interesting.